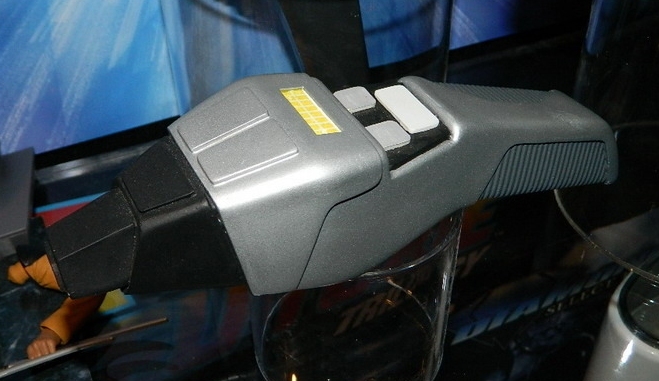 The Trek Collective: New from DST: NX-01, Romulan Bird of Prey, and TNG phaser! 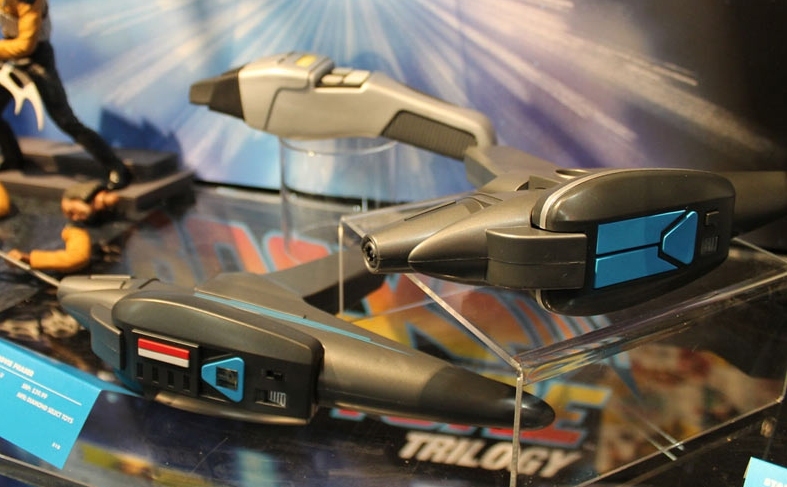 New from DST: NX-01, Romulan Bird of Prey, and TNG phaser! 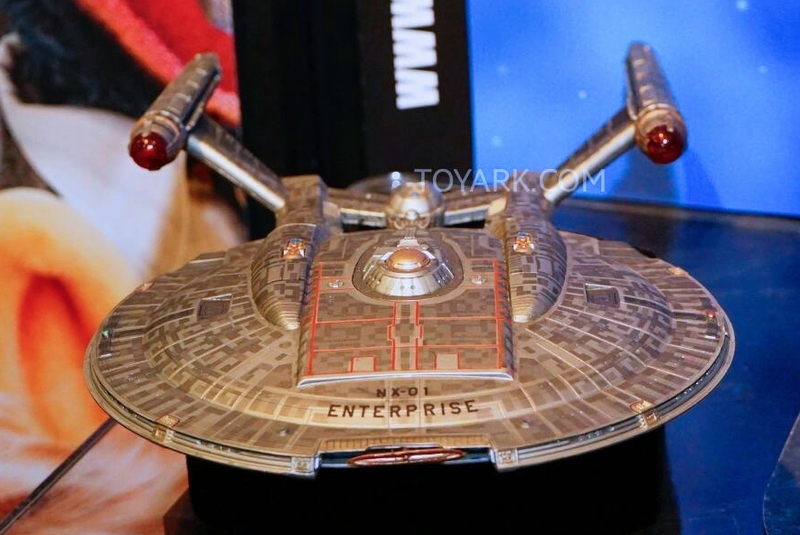 At the Toy Fair over the weekend Diamond Select Toys revealed several new releases in their Star Trek range. Two ships will be coming to their electronic starship model collection. There will be an entirely new TOS Romulan Bird of Prey. This was on display, but photography was not permitted (you can see a nacelle in one of the photos below though). DST like there variants, so I wouldn't be too surprised if we saw cloaked and/or battle damaged versions at some point too. Wow another reissue of a ship they've reissued several times... I'm starting to think they're never going to make any actual new ships. But I must admit the phasers from The Search for Spock have always been my favorite from the Star Trek universe and I've literally waited my entire life for a decent reasonably price replica of one so this is a must. Did you miss the bit about the ENTIRELY NEW Romulan Bird of Prey? I'm pretty pleased with the NX-01; the paint job is a huge improvement, and it's been out of circulation a long time! Well, I can save the money this year. My NX is a bit yellowed, but because of it's color scheme it's not that noticeable. The Bird Of Prey... sigh. Hopefully it sells enough for the line to continue. I really hope there is something else yet to be revealed. After basically teasing for the last year that the next ship would be the Defiant, a Romulan BOP is a huge let down. If they're going to do TOS, why not a D7, which has never been released as a light-up ship before? Can't imagine the BOP's lighting scheme is going to be all that interesting, especially compared to the last few ships they've done. Hopefully the Defiant is next on the list for the second all new release of the year. I'm happy to see the NX-01 re-released with an improved paint job. Always wanted this one, and am glad I waited. But the new TOS Romulan BOP... nice ship, but to do a new tooling on it? They've always said this is a major investment. I'm not sure this was the right choice at all....do any of you think this will sell better than say, Voyager or Defiant? I can't imagine...but I hope it does well for them. Anywho, the new Phasers and Deluxe Worf figure look great and are on my wish list, along with the NX-01. Like everything looking forward to release Hey 1701-C would be great !!! ...The Romulan BoP from TOS? I guess they must have chosen that because it'd be cheap to build and easy to design? Seems like the Defiant and Voyager would be much more popular. And hell, they said they wouldn't bother with an Akira because they didn't think there'd be much demand. They really think the Romulan BoP would have more demand for it? Yikes. Fact is, it would seem pretty obvious, that TOS stuff sells best, by a long way. So yeah, I would say one of the most iconic starship designs from TOS probably will sell at least as well as Defiant or Voyager, maybe even better. As to why not D7 Justin, well I think you've got some good points there, given D7s or variants there of appear in every single iteration of Star Trek, and many more episodes of TOS too. Here's my speculation: Next year is the 50th anniversary of TOS, maybe DST will go for the triple of the most iconic ships from the series: Romulan Bird of Prey, D7, and re-issue of the Enterprise. If they were to do that, issuing the BoP first makes sense, because the D7 is probably more popular, so they want to make sure they secure the sales on the less popular ship before revealing the one more people want more, later (higher chance someone will get both, rather than choosing between the two, if they get the BoP out first is my thinking). I expect that was exactly the thinking that led to them releasing the Enterprise-B (bit obscure, although helped to be more prominent by being an Enterprise) before the Excelsior. As for tolling costs Fox, the BoP has multiple sections, still requiring many parts to build it, and still has lighting and sounds like any other ship. I doubt it's significantly cheaper to produce than any other design. Can someone explain the two versions of the Search for Spock phasers? Where is that variant from? I thought it was fairly obvious: Romulan BoP should be super cheap because its such a simple design (geometry-wise), has need for only for so lights, and doesn't have any texture details or many panel lines. Also: The NX reissue looks identical to the first issue, save for the bkue-painted windows. Hull texturing is exactly the same. I agree, the BOP is probably cheaper to tool and paint, which is why I also assumed they picked that ship. Just hope that you're right about the D7 and the 50th anniversary. If we get a BOP and the Defiant this year, and then a D7 and Voyager next year, I would be happy with that. 1701-C would obviously be great to finish off the Enterprise line, but I would think the demand for that one would be pretty low outside of collectors like ourselves. It is interesting though to note that you can still get a Playmates Romulan BOP for $25 on ebay, while the Defiant and Voyager tend to be in the $75-$100+ range. (For those who don't know, the Playmates' E is -terrible-). That said, it was the Insurrection version of the E which, while terrible, was still less terrible than the FC version. Anyway, Justin: that is some enviable optimism you have there. Two new ships in one year, and two more in another year? It took them like six years to get the Excelsior out.And even then, they ended up announcing and releasing the Ent-B in the middle. According to the Art Asylum blog, their goal is to release two "new" ships in 2015, which they claim does not include any of the reissues. Maybe a pipe dream, but I'm still holding out hope for my favorite "little" ship this year. 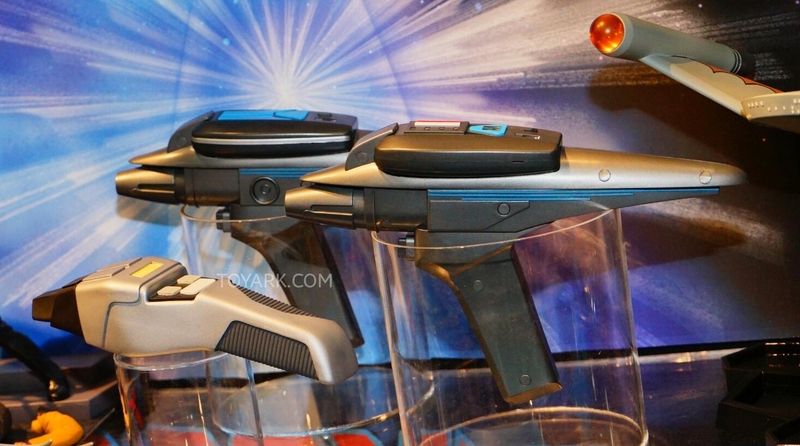 I am super excited for the TNG phaser, i will buy on on launch day. I've been waiting so long for someone to do screen accurate TNG props. Pair this with a science Tricorder and my life will be just that little bit more complete. Thankyou DST!